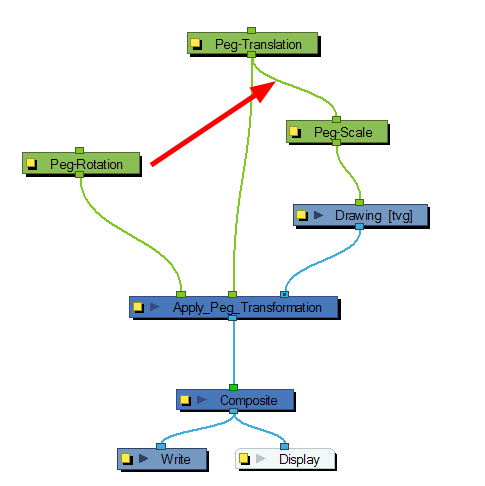 You can use the Apply Peg Transformation's middle port to apply the transformation you connected to the module after one of the Peg or Quadmap connected above the drawing module. When there is no Apply Peg Transformation module, the Peg-Translation is the first trajectory to affect the drawing module. Then, once the translation is applied, the Scale trajectory affects the drawing module. When the Peg-Translation is connected in the Apply Peg Transformation's middle port, the Peg-Rotation is applied after the Peg-Translation and before the Peg-Scale. This means that the translation is done before the rotation instead of the rotation before the translation. 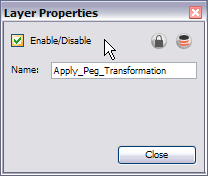 Use the Apply Peg Transformation editor to rename the module.